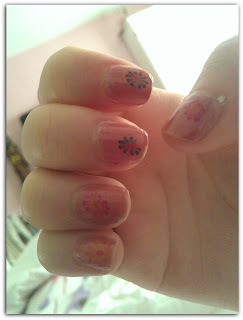 Julia's Fashion Minute: Nail art with temporary tattoos. Nail art with temporary tattoos. 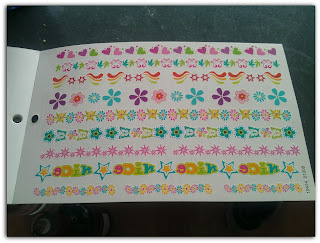 A few days ago I tweeted about how cool some nail art designs are with simply using temporary tattoos. I used the lower row of flower on the right. And I cut it in single flowers expect for the two outer flowers. 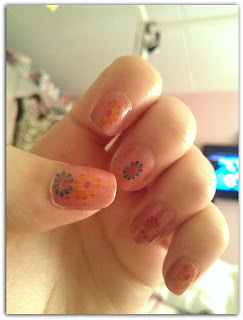 I decided to do two flowers on my thumb and single flowers on my other fingers. Further it's very easy to use, it's easier than applying nail polish. Because if you removed the transparent layer the tattoo will stick to your nail. And with some drops of water it will stay on your nail. And with a topcoat it will look fabulous. The color of nail polish you apply underneed will also influnce the outcome of your nail art.